The pursuit of a youthful face appears to be almost grotesque in the later years. The late Joan Rivers is an example. 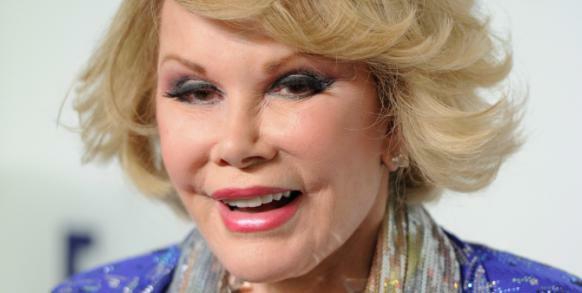 She lived 81 years and this is what her face looked like in makeup in her last year of life. Hyaluronic acid is a space-filling, water-holding gel-like “goo” that resides in the space between cells called connective tissue. Hyaluronic acid produces smooth skin, thick hair, lubricates joints and the human vocal cords, facilitates fullness to lips, and lubricates joint spaces and whole-body flexibility. Very young children have ample amounts of hyaluronic acid whereas older women experience many visible changes of progressive aging as hyaluronic acid production declines or its degradation by enzymes (hyaluronidase, metalloproteinase) is accelerated. The notion that oral hyaluronic acid is not orally absorbed has been dispelled. [Nutrition Journal July 11, 2014] Oral HA is a remedy for dry skin. Ferulic acid taken orally protects against solar ultraviolet aging of the skin. [Food Chemistry Toxicology Aug 2015; Skin Pharmacology Physiology 2007] Ferulic acid is sold as a stand-alone dietary supplement.